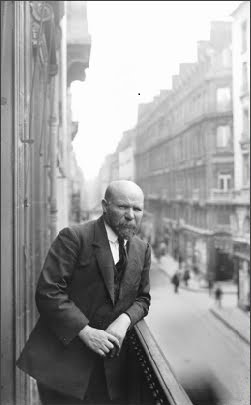 While the American Colony photographers were assembling their collection of pictures of the Holy Land, a French banker named Albert Kahn was commissioning photographers to travel the world (1909 - 1931) to create his "Archives of the Planet." They photographed 72,000 colored pictures and 600,000 feet of film in 50 countries around the world -- including the British Mandate of Palestine. 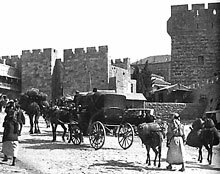 Some of the Kahn collection's still pictures taken in Jerusalem are similar to those in the American Colony collection in the Library of Congress reproduced here in http://www.israeldailypicture.com/. But unsurpassed are the movies taken by Kahn's Jerusalem photographer Camille Sauvageot in 1925. The film below shows the Old City's gates, Jewish prayer at the Western Wall, Christian processions on Good Friday, and Muslims on the Temple Mount. The film below was posted to YouTube this week by Israeli film collector and archivist Yaakov Gross. Visit his wonderful collection of films here.